In 2013, studio ufotable announced a re-adaptation of Nasu Kinoko’s visual novel Fate/Stay Night (2004). Massive hype ensued. 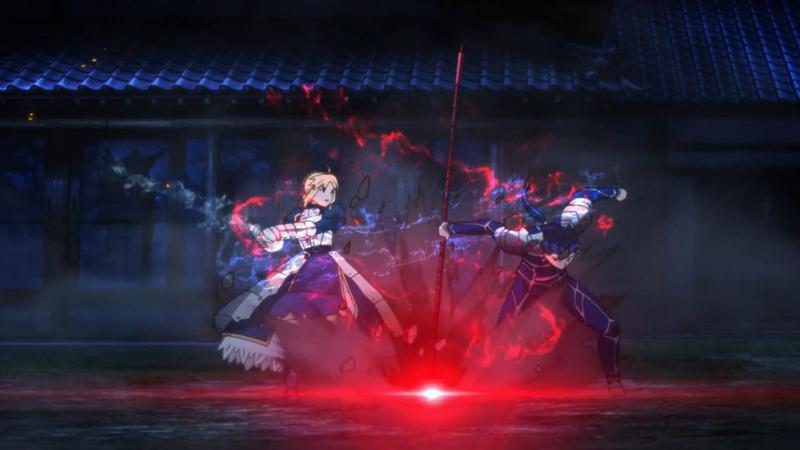 The original visual novel had a sizeable following, but fans were lukewarm about Studio Deen’s 2006 adaptation of the Fate route and the 2010 Unlimited Blade Works movie adaptation. However, its prequel Fate/Zero (2011-12), adapted by ufotable, was quite well received. Thus, many were understandably looking forward to a Fall season that would feature ufotable’s Fate/Stay Night: Unlimited Blade Works (henceforth UBW). Let’s begin with some background. A magical vessel named the Holy Grail allows seven mages to summon seven divinely powerful beings called servants. These servants are legendary heroes, like Hercules, Alexander the Great, or King Arthur. The master-servant teams fight a seven-way battle to the death, and the last team standing obtains the Grail, bestowing them nearly omnipotent power. This premise promises epic battles between legends, and if executed well, can even lead to an exploration of themes like pragmatism versus chivalry, or the worth of human life (as in Fate/Zero). The onus, then, was on ufotable to turn this premise into a compelling story. So how did they deliver? The biggest obstacle in fantasy storytelling is the exposition. Nasu’s works are set in an alternate universe, with a rich history, a myriad of mythical beings, and complex rules of magic. Therefore, any adaptation has their work cut out for them to bring the readers up to speed without forcing them to read the wiki. Fate/Zero (not written by Nasu, but set in the same universe) chose to dump all the exposition into a lengthened first episode, and even then they couldn’t fit all the important plot elements. episode 10: Servants are supposed to be immensely powerful, so how is Kuzuki beating the lights out of one? episode 10 (again): What’s projection magic? When did we see Shirou use it before? How is he suddenly able to do it to such a high level? Evidently, the second season has a lot of loose ends to tie up. UBW so far has a decently promising cast. Emiya Shirou, the visual novel’s protagonist, has a reputation for being an insufferably idealistic human being with no sense of self-preservation. Yet so far, I found him tolerable. 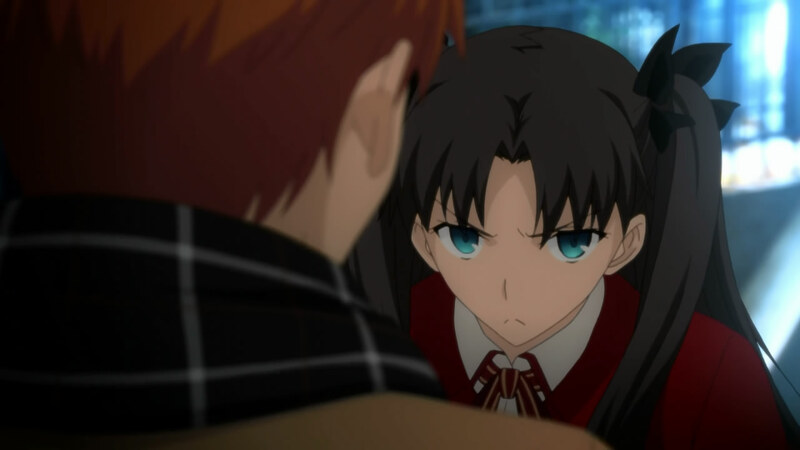 Perhaps it’s because his past and motivations are somewhat explained, perhaps the focus on Rin takes some of the spotlight away from him, or perhaps his cringe-worthy moments so far (not taking Saber around as a bodyguard, hesitating against Caster in the last episode) are somewhat understandable. The female lead, Tohsaka Rin, is an interesting character. We can tell she has complex and often contradicting motivations. So far, we know that her upbringing as a cold, calculating mage conflicts with her compassion for Shirou; that her disdain for his ineptitude at magecraft conflicts with her envy at his more carefree upbringing; that her meticulous planning conflicts with her tendency to screw up her plans at the worst instant (for example, summoning Archer instead of Saber). She’s also quite entertaining: the way she plays off Archer’s cynicism and Shirou’s stubbornness is always fun to watch. I’m looking forward to the second season, where her character can be developed further. Being an ufotable production, the presentation is glorious. Studio ufotable is known for quality animation. In UBW, the colours are vivid, the animation is fluid, and the fights are always well choreographed and a treat to watch. Even the slice-of-life segments looked beautiful. There were some minor nitpicks, such as the CG water effect in the final episode. Overall, though, the animation is beautiful. Seriously. Go look up the previews. The sound was nothing to complain about. Admittedly, I was slightly disappointed when I realized that the composer would not be Kajiura Yuki, but Fukasawa Hideyuki. However, the music was serviceable. I didn’t really notice it, but it never felt out of place or intrusive. The opening and ending themes, too, grew on me as the episodes progressed. So what do I think of the show’s first half? It started off strong, but the story slowed down a bit starting from the halfway point and the inconsistencies began to show. Yet, I can’t help but look forward to the second half. Hopefully, the characters’ conflicts, such Shirou’s idealism and Rin’s conflicting motivations, will get resolved. Hopefully, the story’s loose ends will get tied off. Hopefully, ufotable will continue to produce its top-quality animation. Would I recommend this show to first-timers? Depends. The complex rules of universe can be a barrier, and the writing isn’t as tight as its prequel Fate/Zero. However, for its gorgeous visuals alone, it works solidly as entertainment. Fate/Stay Night: Unlimited Blade Works can be streamed legally on Crunchyroll. You’re spot-on with the writing as compared Fate/Zero: I’ve been saying that so far, this Fate/Stay Night is like a prettier, but much sloppier Fate/Zero. I’m privy to some big reveals that happen down the line, and man is this show going to cause problems for itself if those aren’t adapted well. It’s already put a lot of onus on its second half, and I’m more than a little concerned for it.